I do a mix of paid and personal work, some of which is on this site. I enjoy doing what I loosely call “documentary work”. I’ve been lucky enough to work with a wide range of people, covering events and happenings all over Northern Ireland. I’ve also branched into the inevitable wedding photography gig – and I have to say, I’ve really enjoyed it. I’ve been delighted with the results, and thankfully, so have the happy couples. I travel light. I don’t use a plethora of lights and lenses. I prefer to capture things as they happen. That means I work in a particular way which isn’t always suited to what you might want – but contact me anyway, and we’ll see what we can do. 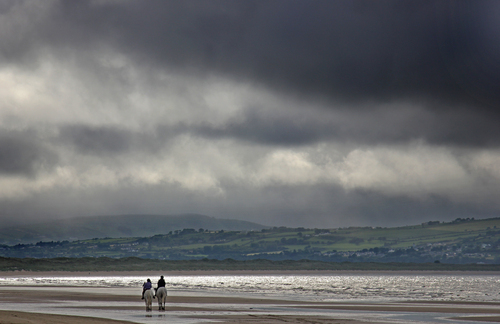 Storm coming in over Donegal, some brave horseriders out and about before the rain.